In short, we have "fracking" to thank. You've probably heard of the term by now. Fracking − injecting wells with chemicals, water, and sand to force natural gas and oil out of rock − has turned the energy markets upside down. Fracking is freeing up enormous amounts of crude from previously unattainable oil deposits. The technology is also making some abandoned wells viable again. Counting the output from Canada and Mexico, a recent report by Citigroup Inc. (NYSE: C) declared North America "the new Middle East." But as production has accelerated in North Dakota, the Canadian tar sands, and the Rocky Mountains, oil has been piling up in the Midwest, particularly Cushing, OK – a primary storage area for U.S. crude. As it happens, that's good news for us. Inventories of U.S. crude increased by 2.9 million barrels to 387 million barrels last week, the highest level since July 1990, theEnergy Department reported. This development is what's behind our investing opportunity in shale oil stocks. You see, all that new oil has to run through pipes to get where it's going. Right now there simply isn't enough pipeline capacity to carry the oil sitting in Cushing to refineries in Texas and Louisiana. And without a way to get the oil out of Cushing, prices for oil there has dropped. 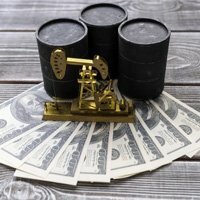 Since this glut began in 2011, prices for the same quality crude have been $8-$25 lower at Cushing than along the Gulf of Mexico, where prices closely follow that of Brent crude in Europe, according to a study by the Energy Institute at Haas. Prior to 2011 there was enough pipeline capacity to keep the price difference between Cushing and the Gulf at less than $2. It's easy to see how pipeline companies can profit from this situation – and several are already making their moves. Recognizing the dire need for their services, pipeline companies are stepping up and increasing capacity as quickly as possible to move the shale oil out of Cushing. The best shale oil stocks fall into the category of master limited partnerships (MLPs). MLPs own and build pipelines and almost everything else involved with the transportation and storage of oil, and are required to pay out all their profits as dividends to shareholders. Money Morning's Global Energy Strategist Dr. Kent Moors advises investors to take a close look at MLPs, especially so-called midstream providers who are experiencing a wave of mergers and acquisitions (M&A). Because of unique tax laws and the potential M&A activity, MLPs provide genuine potential for both price appreciation and a dividend well above market averages, Moors says. One good candidate is Enbridge Inc. (NYSE: ENB) which recently was involved with a partner in a pipeline that will carry 150,000 barrels of crude daily from Cushing to the Gulf. This is the first of a number of pipeline projects – including the southern leg of the Keystone pipeline − scheduled to come on line in the next few years. Another is Linn Energy (Nasdaq: LINE). Linn is involved in the actual production of shale oil and gas and has around 2.8 trillion cubic feet of gas-equivalent reserves, assuring future production growth. Best of all, Linn is fully hedged through the end of 2013 and more than two-thirds hedged through 2014-2015. Whether gas is at $2 or $15, the company should be able to maintain its payout of 8.06%. For more information on these kinds of investment opportunities, you can sign up for Moors' free newsletter, Oil & Energy Investor, by clicking here. I thought Marcellus is a gas shale play, not oil. If so, why is it mentioned in this article ?